Healthy School Lunch Delivery: What Makes a School Lunch Healthy? May 11, 2016 By Article, Home, Mobile App, News, SchoolsComments Off on Healthy School Lunch Delivery: What Makes a School Lunch Healthy? If you work for a school and you are looking for healthy options for your students it can be overwhelming. There are many options out there for schools looking to supply healthy lunches for their students but many leave a lot to be desired. Often healthy school lunches consist of monochromatic, flavorless meals that most kids wouldn’t eat if their life depended on it. As a school administrator, there are many things to consider when researching healthy school lunch delivery for your students. Here are just a few questions you should ask before signing on the dotted line. Do You Use Fresh Ingredients? Fresh ingredients are essential to healthy meals. When food is canned, frozen, or cooked many days before, it loses much of its nutritional value, and even more of its flavor. By using fresh ingredients for your school lunches you are guaranteeing your students get the most out of their school lunches. Does Your Food Actually Taste Good? So many healthy options don’t consider that many kids are terribly picky eaters. It’s important that your healthy school lunch delivery provides lunches that taste good and look appetizing. Providing bland lunches for your students isn’t helping anyone because it doesn’t matter if it’s healthy if the kids won’t eat it. How Do I Know Your Meals are Nutritious? While there are many healthy lunch options out there, it’s important that you find a healthy school lunch delivery that considers everything a child needs for a balanced diet. Your students are growing at an incredible rate and they need the right things to help them grow big and strong. If your school meals aren’t assembled with a balanced nutrition in mind, you may be wasting your time. Is it Easy for Parents? We live in a technological world. Parents want to have everything at their fingertips. Gone are the days of a paper lunch schedules that never worked to begin with because they would often get misplaced. When considering healthy school lunch delivery options it’s important to find options that parents can easily peruse on a website or app, and choose their child’s meals ahead of time for ease of use. The Lunch Mob is dedicated to providing healthy school lunch delivery that is fresh, tasty, nutritious and easy for parents. They work hard to create delicious options for students so eating healthy is fun and easy. The Lunch Mob even has cool characters that help kids learn more about healthy living in a fun and inventive way. Best of all, parents love it because they can easy schedule their children’s lunch menu up to 6 weeks in advance. If you are wondering if their lunches are nutritious just ask their staff nutritionist who works hard to provide balanced, delicious options for your students every day! You can’t go wrong with The Lunch Mob healthy school lunches. They are simply the best option for any school looking to provide healthy lunches for their students today. Is you child a picky eater? Most kids go through some period of time when they refuse to pick up the fork. Some are worse than others, but it’s something that just about every parent has to deal with at some point. They can be particularly difficult when it comes to anything healthy, ESPECIALLY veggies. If this is something that you have struggled with as a parent, you’re in luck: the school lunch program, The Lunch Mob, is here to help with some tips for parents with picky kids. It’s important to respect your child’s appetite. Children often know when they are full. Kid’s aren’t as good at ignoring signals from their body as adults (like when you’re tired but ignore it). Notice how your kids often overreact to a minor scrape or injury? When their body tells them something kids notice! It’s the same with food. A kid who says that they are full, unless they’re just lying, really is full and should stop eating. It’s important for kids to learn to respect that signal from their body telling them to stop eating. So unless you think your little one is trying to pull a quick one on you to avoid that broccoli, let the veggies stay and respect that they are full. Creating and following a particular feeding routine is a good method of breaking through picky eaters. It enables the child’s body to know and expect big meals and little snacks. Begin by setting time for meals and snacks that you adhere to strictly. If a child refuses to eat at that set time, make them wait for the next serving: they won’t miss it next time. One part of your routine is already set: lunchtime at school. A school lunch program like The Lunch Mob provides kids with healthy meals at a set time every weekday. It may be frustrating when you are trying to introduce new foods so patience is required. Children have very strong senses. When they try a new food, it is sometimes the first time they have ever had anything resembling it. There’s not a lot of food experiences for them to relate things to. Be patient with them, and maybe try adding in foods that are similar, if not exactly the same, as other foods they like. Children often learn well through playing and having fun. It is, therefore, important to incorporate these during meal times. Have your kids help you cook or even make trying new foods into a game. These tactics may work in making your kid warm up to the idea of something new. Carry your child along when going for shopping at the grocery store; give them a chance to select their favorite fruits, vegetables, and other healthy meals at The Lunch MOB. Have them help you cook so that they see the process and know what they are eating. If they help, they may also feel invested in the idea that it will be something good. The Lunch Mob is school lunch program that offers all sorts of healthy foods for your child to choose from. With over sixty entree options, The Lunch Mob, is a school lunch program that will keep your child healthy and happy. Saint Patrick’s Day is coming! This Thursday is the yearly Irish celebration for Saint Patrick. Nowadays, this means celebrating Irish culture: parades, festivals, special foods, and getting all decked out in green. As you send your kids off to school in green – so they don’t get pinched – this Thursday, The Lunch Mob wants to celebrate with you and your children! 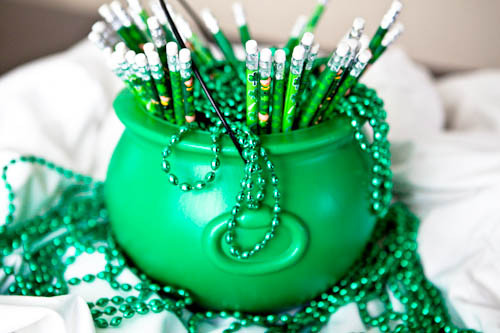 On Saint Patrick’s Day, your kids can pick out either a green beaded necklace or St. Patty’s Day themed pencils. 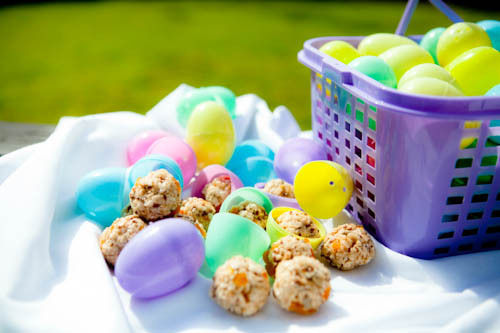 All kids – whether they are picking up a lunch or not – will be able to choose one of these items out of a big green “pot o’ gold” at lunch time. We’re happy to celebrate this fun Irish holiday with you and your families this year! Happy St. Patrick’s Day! In recent years, the government has cracked down on the quality of school lunches provided by public school lunch services, trying to provide America’s children with healthier options. In 2012, the government introduced some changes in their school lunch programs. There were some good updates like the inclusion of healthy fruits in the meal, lowering the quantity of sodium and fat in the meals, and also serving different kinds of meals to different grades of students. However, budget constraints and bureaucracy leave many kids with unappetizing, unripe, and overall unappealing options (if healthier). Because of this, many students skip lunch, eat less, or begrudgingly take the food, which is still often of lower quality and health standards than a growing child requires. A big reason why there has been a steady increase in obese school students nowadays is in part because of unhealthy school meals. Almost one third of children in the USA are suffering from obesity. Although the government has recently regulated the calorie intake of the students, many are left unsatisfied but unappealing options and leave school only to binge on unhealthy snacks to make up for it. Obesity is not the only risk. Any student who consumes too much of fast and processed foods can develop a lot of serious problems in the future. The risk of suffering from heart diseases, diabetes, and even cancer will increase. If the intake of vitamins and minerals is very low, then the students may end up getting tired and will struggle to take part in sports or physical activity only exacerbating the problem. Unhealthy school lunches can also mentally affect your students. Students eating healthy foods are found to be academically brighter. Unhealthy lunches decrease brain power and can also cause memory loss. Poor eating habits can also affect a child’s sleeping patterns, which may influence the student’s behavior and academic performance. However, some school lunch services, such as THE LUNCH MOB, provide an alternative solution to the problem of unhealthy school lunches. THE LUNCH MOB provides school lunch services that are of the highest quality. They always make sure that the lunch given to the students is of the highest quality and contains all the necessary vitamins and minerals. There are no trans fats or unnecessary preservatives in their meals. All high quality ingredients are used. freshness and ripeness are of the highest concern so that meals are appealing while also providing key nutrients. The meals are also cooked in a healthy environment and the students will clearly be able to taste the difference once it’s lunch time. Their school lunch services includes everything from cooking, cleaning, delivery, and also billing. You don’t have to worry about anything. This provides healthy meals to children while providing time to parents in the morning without having to hurriedly pack a meal. They also make sure that the food is delivered to the schools in clean containers. They have more than sixty different kinds of unique items. From their delicious soups to their healthy sandwiches, there is something for every student. They also have separate meals made for vegetarian students. The Lunch MOB provides a quality solution to a real problem. If you feel that your child may not be getting the necessary nutrients in their school lunch, but you lack the time, knowledge, or skill to make attractive and healthy meals for them, then they provide the necessary solution with their school lunch services. It’s one of the biggest cliches in the world: Kids hate vegetables. This unfortunate reality leaves parents to find creative ways to get their kids to eat more fruits and vegetables. While kids are open to eating fruits because most are sweet, feeding them greens and other vegetables is a tall order. Completing this difficult task is certainly worth it though. As children grow, they need to eat a balanced diet in order to develop normally. Failure to feed them properly may lead to nutritional disorders or serious illnesses later in life. One strategy that can help to tackle this problem is by organizing a healthy school lunch delivery. A quality school lunch delivery program such as The Lunch Mob offers children their fruits and veggies integrated into entrees that are kid tested. This makes the greens less intimidating to children, especially if they see other kids are eating it too. This allows them to perform better in class because they are well fed with quality and healthy ingredients. There are many benefits that come with a healthy vegetable-based diet for children. In recent decades children have been fed more and more overly preserved and processed foods that lack important nutrients. But in even more recent years, many parents have begun to identify this problem and are looking for solutions such as school lunch delivery programs like The Lunch Mob. Studies done by Harvard University have shown that there is a powerful link between eating a lot of vegetables and the reduction in the chances of developing cancer. One possible reason for this correlation is that there are some fruits and vegetables that have properties that prevent cancer. However, the studies have not identified the specific fruits and vegetables so it is important to have a variety. Another advantage of having a healthy school lunch delivery is that it has been proven that children and adults that eat more fruits and vegetables manage to keep their blood pressure within acceptable limits. With more people suffering from high blood pressure, the inclusion of vegetables in the children’s diet is likely to have a positive effect later in life. Children are normally susceptible to common illnesses such as having sore throats and the common flu. Research done over many years has shown that children that consistently eat fruits develop a resistance for these conditions. Some fruits such as lemons are known to offer relief from conditions such as a common cold or a sore throat. Vegetables are also good for digestion and children that eat a lot of vegetables are less likely to suffer from stomach complications. It is important to note that the preparation of fruits and vegetables requires a high level of hygiene. The fruits ought to be washed with great care to ensure that they do not cause an upset stomach in children. The Lunch Mob understands the handling of these products and their school lunch delivery program maintains the highest standards of food hygiene and quality in order to provide your children with healthy and fresh foods that will help them stay healthy as they grow. Carbohydrates. The enemy of countless dieters, but is this often demonized nutrient the enemy of our children? No! Carbohydrates in a proper school lunch program are crucial in providing energy to rambunctious kids. The very same energy that adults often avoid to get rid of fat, children need to stay energized. Carbohydrates are broken down into glucose, which replenishes cell energy and fuel not only your child’s playtime, but also their class time. If children are to stay active and alert throughout the day, they need to replenish their brain’s energy by eating high carb foods such as spaghetti, breads, and potatoes. It is important to serve foods, through a proper school lunch program, with enough of the nutrients to fuel America’s growing youth. Children’s developing bodies demand high levels of energy as they grow which is ensured by the use of these foods. Not only their bodies, but also their brains are developing: demanding energy in order to reach their full potential. Sometimes kid’s can feel full even if they haven’t gotten all of the nutrients and energy fueling they need. This can be due to overly fibrous, or empty calorie foods such as candy or even something unexpected like iceberg lettuce. High carbohydrate foods often contain many other important nutrients. For instance, potatoes, when not peeled, contain substantial amounts of fiber and Vitamin C. A serving of pasta provides a third of a child’s daily protein requirements. Additionally, kid’s love many high carb foods. Pasta and potatoes are generally very popular with them, and they also serve as good carriers of other healthy foods. Masking foods such as broccoli or spinach, which are high in vitamins, in these foods is a good way to sneak them in during lunchtime. Finely chopped vegetables mixed into pasta will pass right under a child’s finely tuned radar. Since carbohydrates are such excellent providers of energy for kids and often good carriers of nutrients school lunch program should offer a variety of carbohydrates to ensure a healthy and balanced diet for children. One of the ways to ensure this is by hiring the services of school lunch providers, such as the Lunch Mob, for your child’s school lunch program. The Lunch Mob is a school lunch provider that offers a variety of carbohydrates for children. They offer many foods high in carbs, such as various pasta dishes to fuel children’s play and learning. The Lunch Mob avoids added sugars and empty calories that can be found in many baked products, soft drinks, snacks, sweets, and pastries that are harmful to children’s health and well-being. They provide an immediate spike in energy but are low in nutrition and cause sugar crashes. A school lunch program, such as the Lunch Mob, can provide the nutrients your kids need to succeed. They help continue healthy habits you start at home in order to ensure the proper growth of your children. Getting actively involved in your child’s health by hiring the Lunch Mob can have a positive impact on the way your children eat, learn, and play at school, making for a happier, and healthier child. The Lunch Mob is happy to present a new gluten-free, non-GMO, vegan, organic, and 100% whole grain snack option! Late July’s Organic Sea Salt by the Seashore Multigrain Tortilla Chip provides an exhaustive number of reasons to choose this as a healthy snack. The Late July brand is family owned and operated and they are all about providing the healthiest, most natural, and unadulterated food options just like The Lunch Mob. This snack accommodates just about any dietary need that could come to mind, from gluten free to vegan. It’s packed with nutrition as it’s made from chia seeds, quinoa, brown rice, and sunflower seeds. One serving is only 120 calories, while providing 2 grams of protein and fiber, as well as 6% of the recommended daily iron, and 0 grams of sugar. This tasty gluten-free option provides solid nutrition while navigating around just about any dietary needs. We’re happy to provide a new snack that will make your child look forward to lunch no matter what dietary need must be met. We at The Lunch Mob are dedicated to finding new ways to ensure the safety and happiness of all children at lunchtime! We’re very excited to be providing this snack as an option in all of our lunches! The Lunch Mob is proud to now provide a new gluten-free, non-GMO snack option in our school lunches! The Way Better Snacks brand unlocks nutrients through their unique method of incorporating sprouted seeds, beans, and grains. The Apple Cinnamon Spice Tortilla Chip makes for a nutritious, easy to digest, gluten-free, and not to mention tasty snack! We chose to add this snack option because it is perfect for accommodating children with celiac disease or other gluten intolerances so that they too can have a tasty treat. This delicious tortilla chip not only provides a gluten free option, but also provides big nutrition with the Way Better Snacks “simply sprouted” slogan. One serving is only 130 calories, but packs a nutritious punch by providing Calcium, Iron, and Vitamin A. They even have 2 grams of protein and fiber in this tortilla chip, while keeping sugar intake at a minimal 2 grams as well. At the Lunch Mob we want to ensure that every child has a chance to eat something that is delicious and healthy. It’s important for your children to be excited to eat and for you to rest easy in the knowledge that it is healthy and safe for them. We’re proud to offer this new and exciting snack to accommodate children with gluten-free dietary needs! We take feedback from our parents very seriously and we appreciate those of you who have helped us improve our account center and online order process through your feedback and input. Refreshed account center layout and user interface. We’ve developed and will continue updating our “Resources” on our resource center. Here you can find commonly asked questions, clear descriptions of refund and online ordering policies, and access FAQ’s. We’re launching our new referral program with tracking so parents who help promote us receive discounts when other parents becomes a new customer and order. We’ve made updates to our mobile app providing documentation on how to get started from the mobile app.